Kare Kano | Manga Reviews ~ Ramblings of A Fob. There are often those titles revered to as essential to every genre of manga. As so happen, Kare Kano is one of that series regards as vital in the realms of shojo. In any case, Kare Kano starts off like any other shojo. We all know about the ever so cliche rivalry between the main characters. 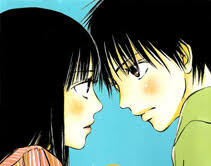 In this series Miyazawa is your perfect shojo heroine; she’s pretty, smart, and all around popular amongst her peers. However these perfect acts of her is just to get all the attention and praise she can get from everybody. Although her model perfect exterior is definitely well deserved as she works hard for them. But of course with this kind of set up Miyazawa should definitely have her rival, Soichiro. He is another role model student who have the ability to top Miyazawa in almost every aspect she is good at. Throughout the volume we see Miyazawa work so damn hard to beat Soichiro so to get all the attention of everyone to herself. She has an amusing personality and I love that she knows what she is, a vain person. Its all so very entertaining. Her quirks and schemes are executed right on the spot. Her family household is where I found the most sheer of amusement. Miyazawa’s family are all so pleasantly lively. In reality though at home Miyazawa is a geeky looking slob person. When Soichiro drop by her house he accidentally sees the “real” Miyazawa. Thus Soichiro took advantage of this so to get close to her. Soichiro “blackmailed” Miyazawa so he could have her do things for him like extra activities and such. They spend a great deal of time with each other often having sarcastic often cute banters. But of course Miyazawa started to developed “feelings” towards Soichiro and misunderstandings ensues. So yeah its definitely a solid start of the series. I like it so far. Both of the main character is likeable especially Miyazawa. Props to her I like her alot. So hopefully she stays true to herself to avoid being the irk girl that shojo titles are notorious of. One thing I can say though, since I’ve read a fair amount of reviews about Kare Kano that it gets dark in the latter part. I kind of tell it as early in this first volume as the character(s) especially the main guy has something deepishly shady air. The bonus story in the end is as charming as the main story. I like that oneshot its quite memorable. Its too early for me to tell if this series would live up to its reputation. Afterall, I often find what is something amazing to the majority to be such a disappointment. But if Kare Kano becomes something like Marmalade Boy then I’m sure it will be a rollercoaster of a drama. I will love it.